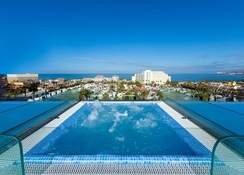 Located in the heart of Playa de las Americas, the Tigotan Lovers & Friends Playa de Las Americas is an adults-only hotel. Soak up the sun on the beach or poolside at this spacious, modern retreat, conveniently located to Tenerife’s Golden Mile, where you can shop at designer boutiques. 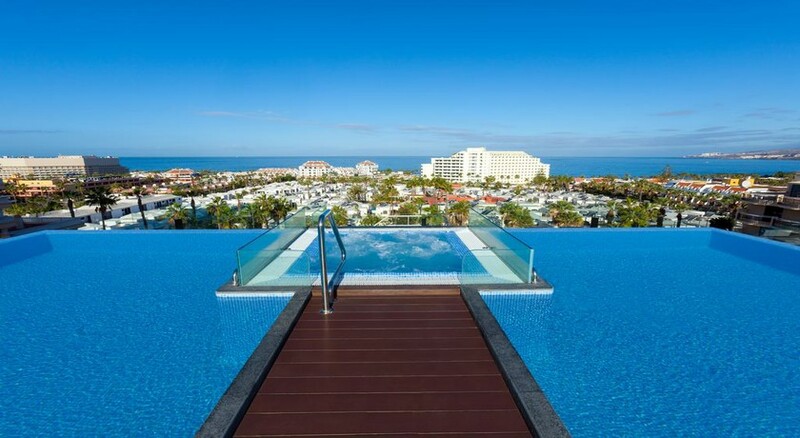 With three pools and glorious blue skies almost all year round, this corner of Tenerife is known for its luxurious hotels and excellent entertainment. The resort comes with three pools bars and restaurants, where you can enjoy show cooking. It’s the perfect getaway for a romantic break. With a famous rooftop bar, where you can sunbathe or sip a cocktail as the sun goes down, this is a cracking hotspot for romance. The elegant complex's 416 rooms, which include exclusive Dream Suites with outdoor Jacuzzi pools, come with terraces that offer great views of the outdoors. The Tigotan Lovers & Friends is located 1.5km from the resort centre, a short walk from Tenerife’s main centre called the Golden Mile. 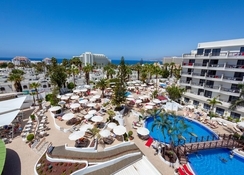 The closest beach to the hotel is the Blue Flag Las Vistas, one of Tenerife's largest. A five-minute walk brings you to the smaller El Camisón beach. Troya, Fañabe and El Duque are some other beaches you could visit. The Tenerife South Airport is about 16km from the hotel, making it convenient for guests to board their flights on time. The resort offers rooms, across four floors, with private terraces, where you can enjoy cocktails, while looking out at stunning views of the sea, gardens and outdoor pools. Choose from Single Rooms, Single Rooms - Pool View, Double Room, Double Rooms-Pool View, Smart Room Pool View and Suites that comes with an extra-large terrace. Romance rooms come with an open-plan layout featuring a romantic rain shower and mood lighting. All rooms come with a terrace or a balcony with pool views. Choose between full board and half board options and enjoy the hotel's restaurants and cafes. The Areca restaurant treats you to local and international flavours, with a sunny terrace located next to the pool. The Santa Rosa Grill offers a great dining experience and fantastic steaks, such as the tasty T-bone steak, paired with the Argentinian chimichurri sauce. Check out the Beach Club bar, which brings your drinks to your poolside sunbed, and the Bar Hall - a spacious lounge, where you can spend some quality time on your own or with friends. During the day, you can soak up the sun at one of three outdoor pools or the outdoor Jacuzzi. Walk to the nearby sands, where the promenade leads to some of the best beaches in Tenerife, with crystal clear waters inviting you to take a dip. In the evenings, the resort features some great entertainment, including live shows and performances. 5-10 minute walk from beaches and shopping centres. Great staff and friendly atmosphere. Would recommend and would go back in a heart beat. Had a fantastic stay at Tigotan last summer. Me and my friends where looking for a last minute getaway and wow where we in for a treat. This hotel is stunning and even smells good. Staff were so helpful and the facilities and activities provided was simple brilliant. Had a fantastic time here and look forward to returning.